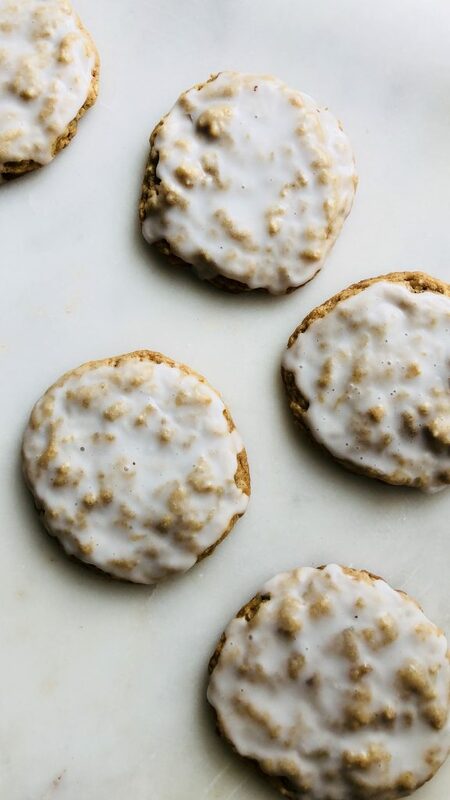 Oatmeal cookies are my go to cookie, and will pick them over any other cookie anytime. They are comforting and remind me of home…and you can make them fairy healthy with a few changes. I was surfing Pinterest a few years ago for a oat/blueberry cookie and landed on Lady Pups blog. She has an amazing recipe for blueberry oatmeal cookies. I have changed the recipe some, but used hers as my foundation. The blueberry version is so good and still make it frequently. I made these to take to a friend’s lake house over Labor Day weekend and chose cherries and dark chocolate because I knew we would be opening a few bottles of red wine :). Feel free to get creative with your combos. I am going to experiment with rosemary and apricot soon! 1. Combine both flours, oats, salt, and baking soda in a medium size bowl. 2. Beat butter in bowl of a stand mixer on medium speed, or in large bowl with hand mixer until soft and fluffy, about 1 minute. Add sugar and coconut sugar and combine for another 30 seconds. 3.Next add egg and mix until thoroughly combined. Add vanilla extract. 4. Take a spatula around the perimeter of bowl and fold all ingredients together to ensure all are well combined. 5. Now stir in your add-ins. In this case I chose chocolate chips, dried tart cherries and shredded coconut. 6. Chill dough in refrigerator for 30-60 minutes. 8. Remove dough from fridge. Use standard size cookie scoop or measure 2 tablespoons of dough and place on parchment lined baking sheet. I usually only bake 6-8 cookies per sheet. I also always only bake 1 tray at a time. 9. Bake for 10-11 minutes. If you make your cookies larger than a standard cookie scoop bake for 12-15 minutes. You do not want to over bake these. They can go from soft to a hockey puck quickly :). The very center of the cookie may look slightly shinny in the oven, but the edges should be starting to set. I pull mine out by this point. Allow cookies to cool for 10 minutes. They will firm up some when cooling, but you should still be left with a soft cookie. My boyfriend loves blueberry muffins. 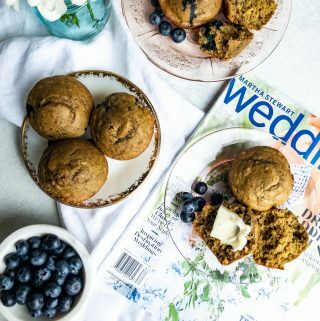 I will say I feel my blueberry muffins helped him love me…jk…kind of :). I have a few different blueberry muffins, but he prefers these. These are soft, fluffy and incredibly moist. You can sub any fruit you would like depending on time of year and your taste preference. I’m thinking brown butter pears or apples with cinnamon would be a great fall swap. These are a great on the go snack, post workout snack or light breakfast! 2. Spray top of a muffin pan with cooking spray and line with paper liners. You may also forgo the liners if you spray well or rub with soft coconut oil. 3. In a medium bowl combine flour minus 1 tablespoon (1 1/2 cup), baking powder, baking soda, cinnamon, nutmeg, salt and poppy seeds. Whisk to combine and set aside. 4. In a large bowl combine oil, egg, honey, coconut sugar, yogurt, and vanilla. Whisk to combine. 5. Next, slowly add dry ingredients to wet. Combine via spatula, scraping down sides of bowl to ensure ingredients combine well. 6. Sprinkle blueberries over top of batter, followed by 1 tablespoon of flour. Fold in with spatula. This helps ensure blueberries do not sink to the bottom. 7. 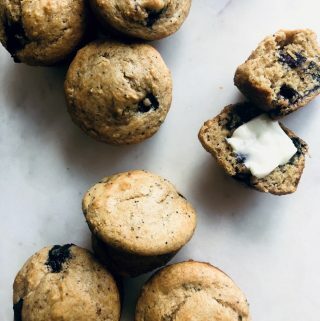 Scoop batter into prepared muffin tin with a cookie scoop. Fill 3/4 way full. 8. Bake muffins for 15-18 minutes until toothpick comes out clean or with only a few crumbs. 9. Allow to cool in pan for 5 minutes, then transfer muffins from muffin tin to a cooling rack. 10. Serve warm with butter! These muffins will stay fresh covered at room temperature for 2-3 days. Store in fridge days 3-5. • I used So Delicious plain coconut yogurt. You may use any runny yogurt of choice. I cannot vouch for how a thick 2% greek yogurt would turn out, but likely be just fine. If anything I would add 1-2 tablespoons of milk to thin it out to resemble a thinner yogurt. • You can replace gluten free flour for all-purpose or whole wheat pastry flour. 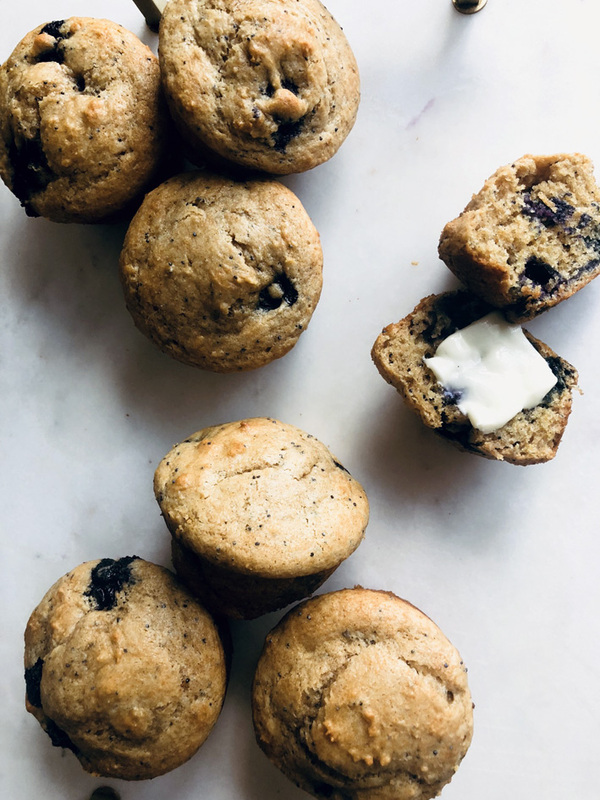 • I have not tried these with frozen blueberries, but if using frozen I would add the blueberries when they are frozen. I would not thaw them. Thawed berries tend to bleed and make the batter purple. This is especially true with the smaller wild blueberries. I have used frozen berries in oatmeal cookies and they turn out great. When cold they tend to adhere to batter better and not sink to the bottom. Sometimes you just need a cookie! These cookies are soft and just sweet enough. I absolutely do not feel I am compromising in the least when enjoying one of these. 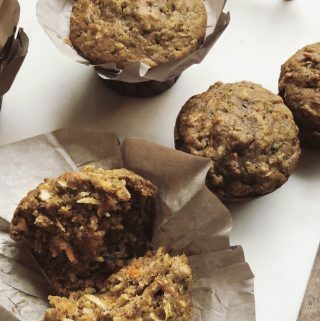 These gems are full of good fats, whole grains and something your whole family will enjoy! 1. Combine buckwheat flour, oat flour, gluten-free all-purpose flour, baking soda and salt in a small bowl. Set aside. 3. In a second larger bowl, whisk the egg and egg yolk. 4. Next, whisk coconut sugar, coconut milk, coconut oil, vanilla and cooled coconut butter into eggs. 5. Add bowl of dry ingredients to wet in 2 additions. Combine via wooden spoon and finish with spatula to ensure all ingredients are thoroughly incorporated. 6. Fold in shredded coconut and chocolate chips. 7. Allow the batter to rest for 5-10 minutes. 8. Scoop cookies with standard size cookie scoop, or roughly measure 2 tablespoons of dough. 9. Place in parchment lined baking sheet. I do not bake more than 8 cookies at a time, and only 1 tray at a time. 10. Bake for approximately 10 minutes. You want to avoid over baking to ensure these cookies stay soft. I always check mine 1-2 minutes before the anticipated cooking time. 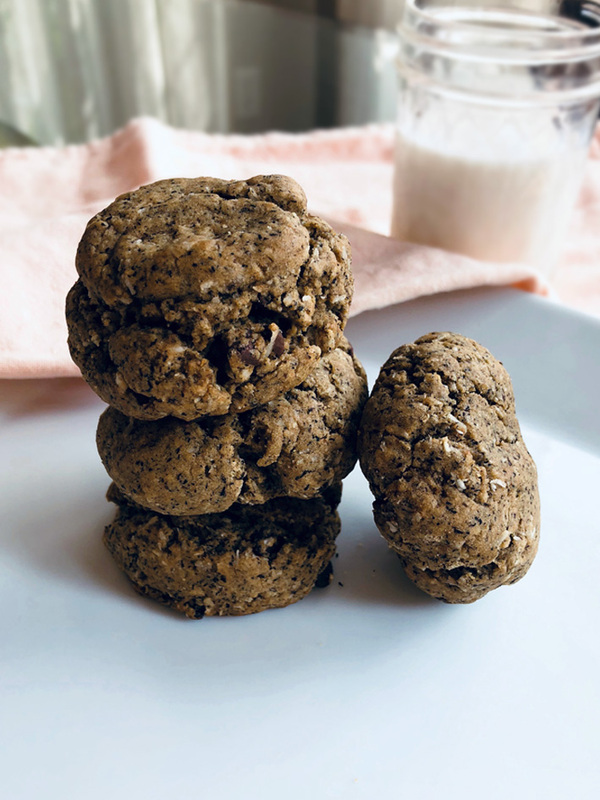 •The buckwheat flour softens over time, therefore you will likely feel the cookies are even softer the next day. Store in a closed, air-tight container. •Coconut butter will be very firm in the jar. It resembles a peanut butter that separates with the oil on top. The difference is it will be solid, rather than runny. I find it easiest to place a saucepan filled with a few cups of water on low over your stove top. You do not want to boil the water, rather warm it. Remove any plastic labels from the coconut butter jar and place it in the pan with water. I usually put in enough water to reach half way up the jar. Allow the jar to rest in warm to very warm water for a few minutes. You will be able to stir the mixture shortly after it heats through. It will have a consistency similar to tahini. Now you can measure and carry on baking! 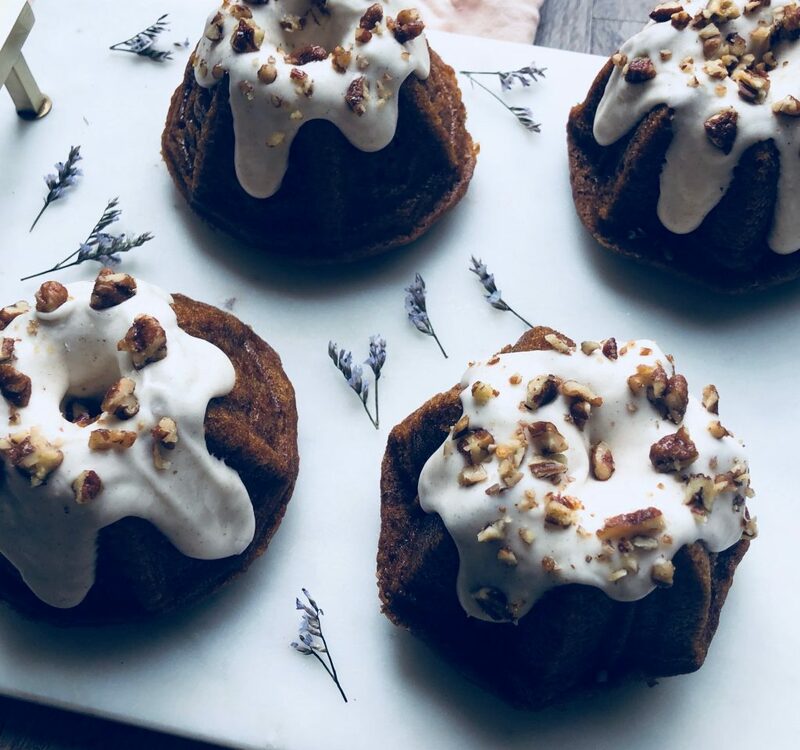 Lavender adds a lovely warmth and floral essence to baked goods. I find myself using it more and more, and is actually the main ingredient in my most requested recipe. 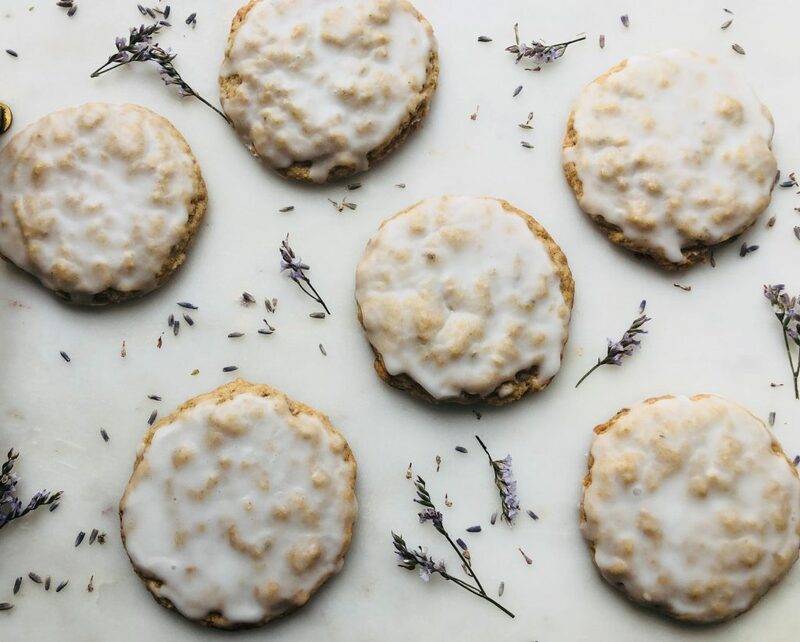 I sell baked goods to friends and small businesses in Indiana, and have the largest request for my iced lavender oatmeal cookies. I know the thought of tasting lavender may not seem appealing at first, but I assure you most who try it end up loving it. The key is to not use too much to ensure it is not overpowering. 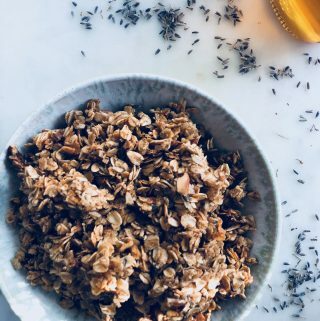 I linked the type of lavender I use on my baking products page. I purchased the lavender stems for decorating here. You can take the buds off the stem also rather than ordering buds and stems separately. 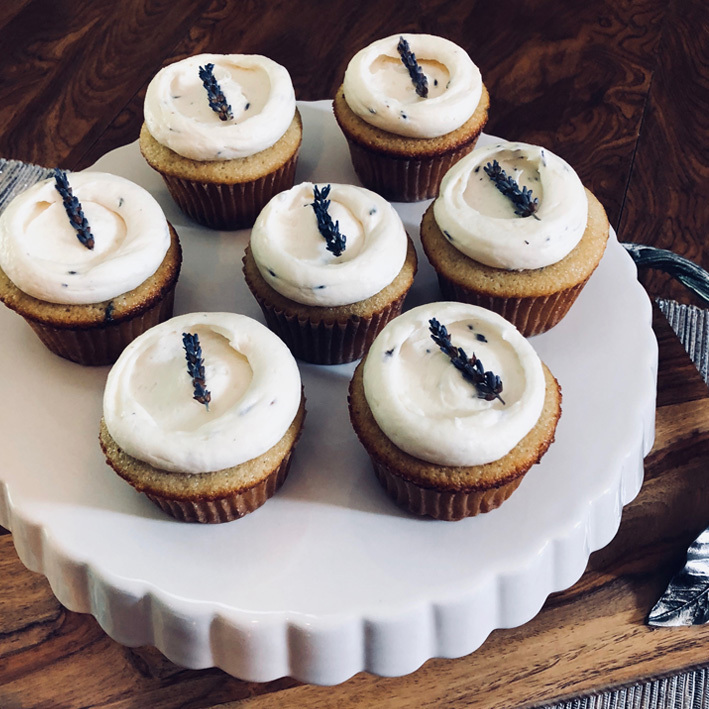 These are my vanilla bean cupcake recipe with lavender added – no other difference :). I feel so strongly about this vanilla cupcake recipe it is hard for me to use anything else. I have been experimenting and will absolutely share if I create or find anything I think surpasses these :). 1. Preheat oven to 325 degrees. Spread a thin layer of Crisco or soft coconut oil over the top of the cupcake pan to prevent sticking in case cupcakes rise over edge. Fill with parchment liners and set aside. 2. Sift the dry ingredients into a large mixing bowl, or the bowl of a stand mixer. Make sure to spoon flour into the measuring cup to avoid packing flour. This can dry out your cupcakes. 3. Add oil, hot water, and milk to dry ingredients. I know this backwards from the traditional way of combining ingredients :). Mix flour and liquids together for one minute over medium speed. Scrape down sides of bowl with a spatula to ensure even mixing. Many times excess flour will hang out on the bottom of the bowl. 4. Add eggs one at a time, followed by vanilla bean paste. Beat on medium-low speed for another minute. 5. Lastly, add chopped lavender buds. You batter should look thin at this point. I know it may seem really thin, but you’ve got it right. 6. Pour batter into a 2 or more cup measuring glass with pouring spout. If you do not have one no worries, you can use any large container with a pouring spout, 1/4 cup measure or a large cookie scoop. I find it easier to pour the batter in because it is rather runny, but can easily fill with other methods mentioned above. Fill each liner approximately 2/3 of way full to allow some room for rising. This will be about 1/4 cup of batter. 7. Bake for 13-15 minutes. A wooden toothpick should come out clean or with a few moist crumbs when inserted. 1. Place butter in stand mixer fitted with paddle attachment, or large bowl if using hand mixer. Beat butter until smooth, ~ 30-60 seconds. 2. Add vanilla bean paste and lavender buds. Mix another 30 seconds. 3. Slowly add the sifted powdered sugar 1-2 cups at a time. The mixture will become rather thick. Start adding milk 1 tablespoon at a time to help mixer along. Add food coloring and titanium dioxide at the end of mixing if using. 4. Once all ingredients are combined beat on medium high speed for 2 minutes. • I prefer to use vanilla bean paste instead of extract in cupcakes. The paste adds a nice richness, as well as vanilla bean flecks throughout cake and icing. May also use a vanilla bean. 1 bean is equivalent to approximately 1 teaspoon of extract. • Titanium dioxide helps brighten your icing. It will also make white icing brighter. Make sure to look for organic and non -GMO versions. I linked the type I use in my baking products page. • I like to roughly chop my lavender to ensure I do not have any large pieces. If the lavender is somewhat fresh, like the stems I linked above, this will help release some of the natural oils to enhance the taste. There are some things you just do not mess with. This recipe is absolutely one of them! 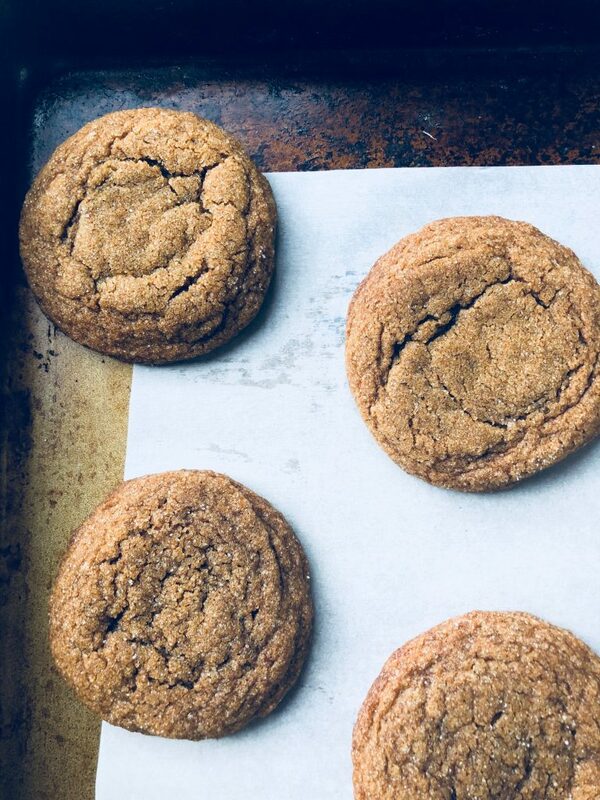 These molasses cookies from Cooks Illustrated are one of my favorite cookies of all time. I love ginger, and fortunately for me it is fall, so ginger and pumpkin are in! The only change I made to this recipe was adding a full egg versus just the yolk. I felt this made them just a little softer and chewier. I did also omit the black pepper. 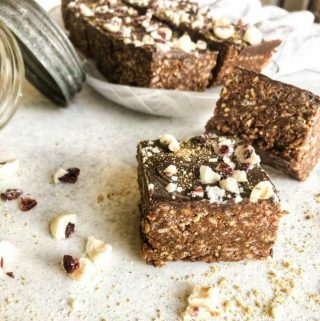 I have not tried these gluten-free, or with my typical substitutions such as coconut sugar, coconut oil, etc., because as I said, there are some things you just do not mess with :). 1. Adjust oven rack to middle position and preheat to 375. Line a baking sheet with parchment paper. Place 1/2 cup sugar in a small bowl for rolling cookies. 2. Whisk flour, baking soda, spices and salt in medium bowl until thoroughly combined, set aside. 3. In stand mixer fitted with paddle attachment, or in a large bowl with a hand mixer, beat butter with brown and granulated sugars at medium high speed until light and fluffy, about 2 minutes. Reduce speed to medium low and add egg and vanilla. Increase speed back to medium high until ingredients are incorporated, about 20 seconds. Reduce speed back to medium-low and add molasses. Beat until fully incorporated, about another 20 seconds. 4. Scrape down bottom and sides of bowl with rubber spatula. Reduce speed to lowest setting; add flour mixture and beat until just incorporated, about 30 seconds, scraping bowl down once. Give dough a final stir with rubber spatula to ensure that no pockets of flour remain at bottom of bowl. Dough will be soft. 5. Scoop 2 tablespoon worth of dough per cookie, or use a standard cookie scoop. Roll dough between palms of hands to form a ball. Drop ball into bowl with sugar and roll to coat. If dough sticks to your hands too much when rolling lightly wet hands. Repeat forming and rolling balls into sugar. Place on prepared baking sheet. 6. Bake approximately 10-12 minutes. When these are done the edges will be just set, but middle will still appear slightly shinny/not cooked through. Remove cookies at this point as they harden quite a bit when cooling. 7. Cool on baking rack and make yourself a chai tea to enjoy with your cookie! •Make sure to only bake these one sheet at a time. If you try to use two baking sheets on two different oven racks the bottom rack will not achieve the desired cracks on top. I have used this recipe for pumpkin cake, pumpkin cupcakes and mini bundt cakes. The mini bundt cakes are my favorite :). I can say this is one of the absolute best recipes I feature on my blog. This pumpkin cake is out of this world good! It is incredibly moist and full of all the flavors of fall. I came across this recipe in the cookbook Butter by Rosie Daikyn. Everything she bakes is amazing. 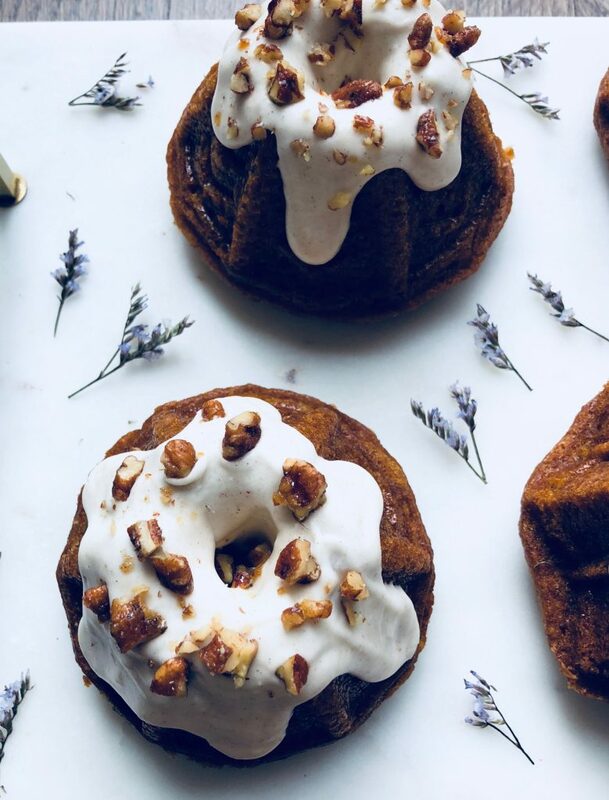 I came up with a cinnamon cream cheese glaze to top the mini bundt cakes with that takes these to a whole new level of AMAZING :). I have not tried to create another pumpkin cake recipe because I do not know how one could be better than this. I can assure you your family and friends will not be disappointed in this recipe. 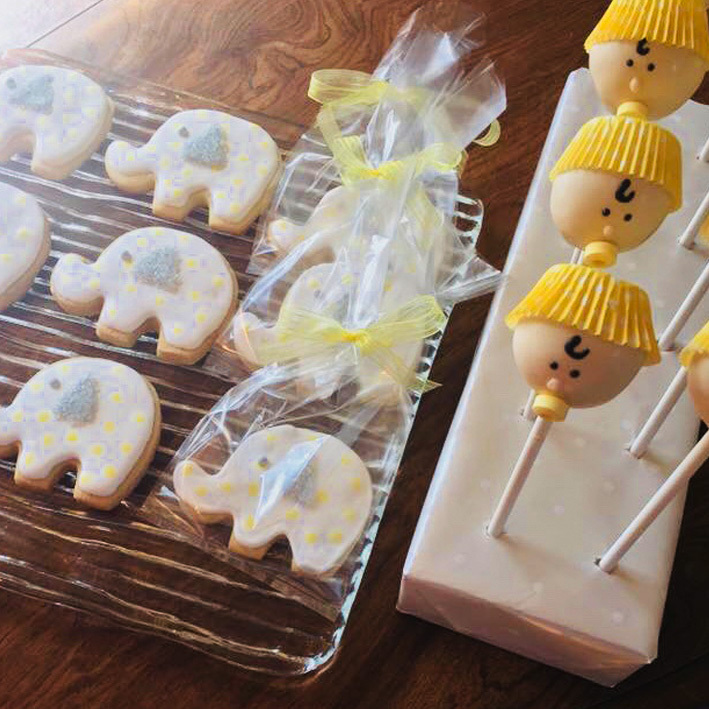 My cousin even asked for these at her wedding shower in May :). I cannot blame her because I would do the same…they are that good. This recipe is meant to be mixed by hand, making them even easier to whip up. 2. In a large bowl sift flour, baking powder, baking soda, cinnamon, nutmeg, ginger, and salt. Set aside. 3. In a second large bowl add oil and both sugars, whisk to combine. It will be a little thick, but the eggs will loosen batter. 4. Next whisk in eggs, one at a time, followed by vanilla extract. 5. Add dry ingredients to wet in two batches. Fully combine by folding and stirring with a large spatula. Be careful to not over mix. 6. Next add pumpkin and mix again until fully combined. The batter will be halfway between thin and thick. Scoop into bundt pan with oversize muffin scoop. Fill pans about 75% full. I use about 1/2 cup of batter per mini bundt. 7. Bake for approximately 20-22 minutes, or until toothpick comes out clean. 8. While the cakes are baking make the glaze. Beat butter and cream cheese in a medium bowl via hand mixer or stand mixer. Add cinnamon and salt and mix again. Sift powdered sugar directly over the bowl and mix in 1 cup at a time. Lastly, add milk by the tablespoon. I recommend adding slowly to ensure you get the consistency you desire. 4 tablespoons of whole milk will give you the glaze pictured here. 9. Remove bundts from oven and allow to cool in pan for 10-15 minutes. Once pan is cool, remove cakes from pan by placing a cooling rack (small one about size of cupcake pan) over the top of the bundt cake pan- this is really the bottom of the cakes. Hold the edges of the cooling rack and bundt cake pan together and quickly flip over. Be sure to not hold the cooling rack too tight against the pan or you may smash the cakes. If they did not rise over the edge you will not need to worry about this. If they rise over I put my pointer finger in between the rack and pan to ensure I do not smash them when flipping. Allow cakes to cool completely before adding glaze. If glazed when warm it can thin the glaze further, causing it to be overly runny. To glaze cakes, spoon glaze over top of bundts. I use a few tablespoons per cake. Lightly push glaze over the edge to achieve a natural drip look. This takes some practice so do not be discouraged! I usually set aside one cake to be a “tester” to get my mistakes out :). I top mine with dried rose petals or roasted and chopped pecans. • You may replace the flour with gluten-free all purpose flour. • If you want to make these dairy free you can use unsweetened almond, coconut or cashew milk in the glaze. Light coconut milk from a can will also work well. The full fat is probably too thick. • I linked the bundt cake pan and specific baking pan spray on my baking products page. • Gluten-free all purpose flour will have the xantham gum, tapioca, etc already mixed it. It can be replaced at a 1-1 ration. I linked my favorite brand in my baking product page. I came across this amazing oatmeal cookie from Jenn on her blog Mother Thyme. I absolutely consider this to be the best oatmeal cookie recipe. 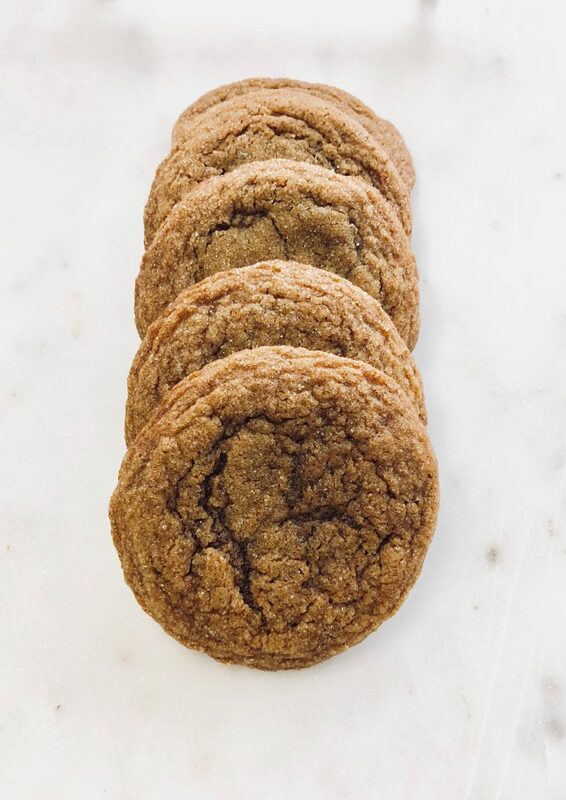 It is warm, soft and comforting – everything an oatmeal cookie should be! I have developed a strong love for lavender and added it here. I actually receive more requests for the lavender version than plain through my small private baking business. For my dietary needs I have made this recipe gluten-free, but the original is not gluten-free. I get a lot of requests for these cookies from friends and family and use regular all-purpose flour. You simply use a 1 to 1 substitution between the two flours. • You may add 1/8 teaspoon rose water extract to the glaze ingredients above. This is very strong. I have ruined recipes before by adding too much. I linked the type I use in my baking products page. 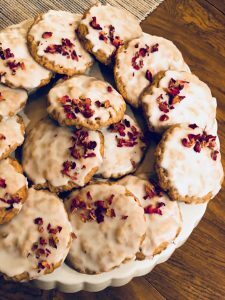 • You may sprinkle 2 tablespoons chopped rose petals over the cookies just after dipping in glaze – also linked on baking product page. 1. Preheat oven to 350 degrees. Line baking sheets with parchment paper and set aside. 2. Place rolled oats in a food processor and pulse lightly until coarse, approximately 10 pulses. You still want some texture to the oats. Set aside. 3. In a medium bowl add flour, baking powder, baking soda, salt, cinnamon and nutmeg. Add in pulsed oats. Set aside. 5. Add in eggs one at a time, blending well after each addition, then vanilla extract or paste. 6. Add flour mixture in 2 batches until combined. 7. When ready to bake, allow the dough to rest at room temperature for 5-10 minutes. Use a traditional cookie scoop and place on parchment lined baking tray 2 inches apart. I bake no more than 8 at a time. 8. Bake for 9-11 minutes until the bottoms begin to brown. You want these to look slightly underdone in center and just set on the outside border. These will firm up when they cool on cookie sheet. This gives you a SOFT, delicious oatmeal cookie. I have created a few hockey pucks..trust me :). 9. Cool on the baking sheet for 5 minutes before transferring to a wire rack to cool completely. 10. Sift confectioners sugar into medium to large bowl. Add milk and stir with spatula to combine. Set glaze aside until ready to dip. 11. Gently chop your rose petal tips into small pieces. If you have rose petal tips you will only need to roughly chop them a few times, as they area already fairly small. If yours have a small stem attached hold onto this for stability and finely slice of the top 3/4 portion of the rose. This will leave you with pretty pink petal pieces. Discard the base which is made up mostly of brown and dark green leaves. 12. Once cookies are cool, dip tops of cookies into glaze for 1-2 seconds and let excess drip off. 13. Place back on wire rack and sprinkle rose petals over 1/3 of cookie, or in any pattern you’d like – have fun with it! 14. Store cookies in an airtight container for up to 5 days. 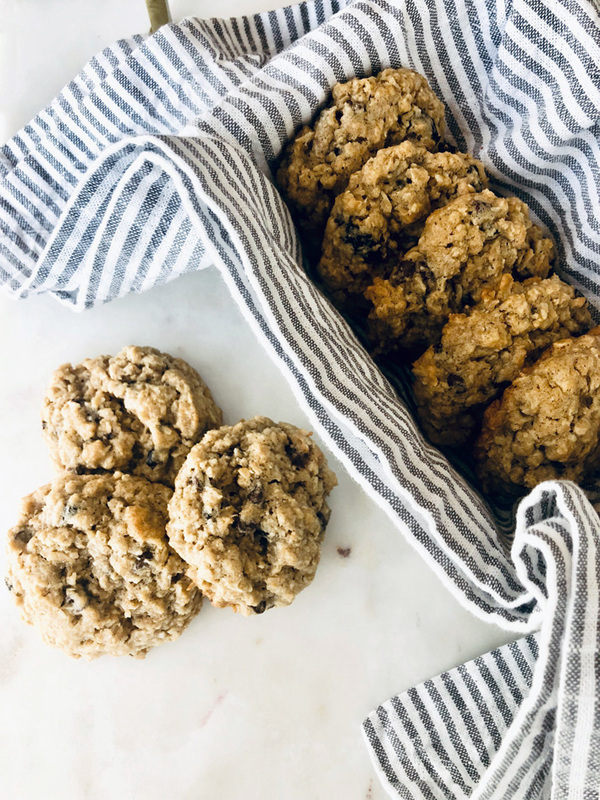 • To have these cookies turn out flat, you do not want to over ground the oats, just a couple quick pulses in the food processor to break them up a bit. If the oats are finely ground, the cookies will not spread. You want to keep the oats partially in tact as they create texture. • You can buy dried rose petals here. • Vanilla bean paste makes a big difference in this recipe. It provides another layer of warmth and richness to these cookies. I also linked it on my baking products page. I came across this recipe from the website “Kitchn”. These cut out cookies are so delicious on their own, but I made a few small modifications. I left out almond extract because I do not care for it, as well as the lemon zest to allow the vanilla extract to come through. I also decreased the baking powder to just 1 teaspoon to ensure these cookies have only a little rise. If they rise too much the surface may become uneven, making decorating more difficult. These cookies are thick, buttery and soft if taken out of the oven on time. The addition of cream cheese really sets these apart from other cut-out cookies. Be careful when baking these, because if baked too long they will turn form soft to brick quickly. I bake mine until the tops are just set and center of cookie is barely glistening, ~ 8 minutes. If the edges have started to brown they are likely over baked. It is important to allow these to cool on cookie tray for 5 minutes to firm up before transferring. I have cried “man down” many times when trying to transfer them to a drying rack too soon. This did not turn out too bad though, considering I had a few extra to snack on while decorating….darn :). I will also mention this recipe is not gluten-free. I had a lot of trouble making gluten-free because the dough would not come together well, rather became very crumbly. I tried increasing the amount of fat and liquid but still had trouble. I am determined to create an amazing gluten-free cut out cookie, and will absolutely share with you all soon! 1. In the bowl of a stand mixer (or in a large bowl, using a hand mixer), cream butter and cream cheese with sugar. Beat for 1-2 minutes until light and fluffy. Beat in egg and vanilla extract. 2. Mix the flour, baking powder, and salt in a separate bowl. Gradually add to the butter and sugar mixture until fully incorporated and a soft dough is formed. 3. At this point the dough can, and should be, chilled or frozen. If making cookies in the near future, divide the dough into 2 balls and roll each out to 1/4 to 1/8-inch thickness between large pieces of parchment paper. I tend to roll mine on the thicker side, ~1/4 in. Refrigerate for at least 1 hour. You may also freeze the dough balls by wrapping in plastic wrap, freezer paper and a freezer plastic bag for up to 1 month. To thaw, leave in the refrigerator overnight then proceed with the recipe. 4. To bake the cookies, preheat the oven to 350°F and prepare baking sheets by lining them with parchment or a Silpat. Dust a light layer of flour over your dough and dip your cookie cutter in a small bowl of flour. 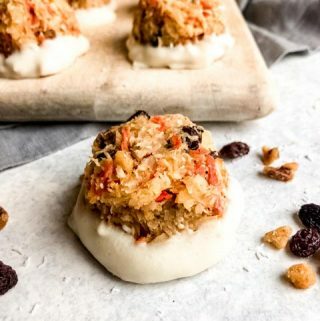 Cut cookies out of the rolled dough and place on the prepared baking sheets. 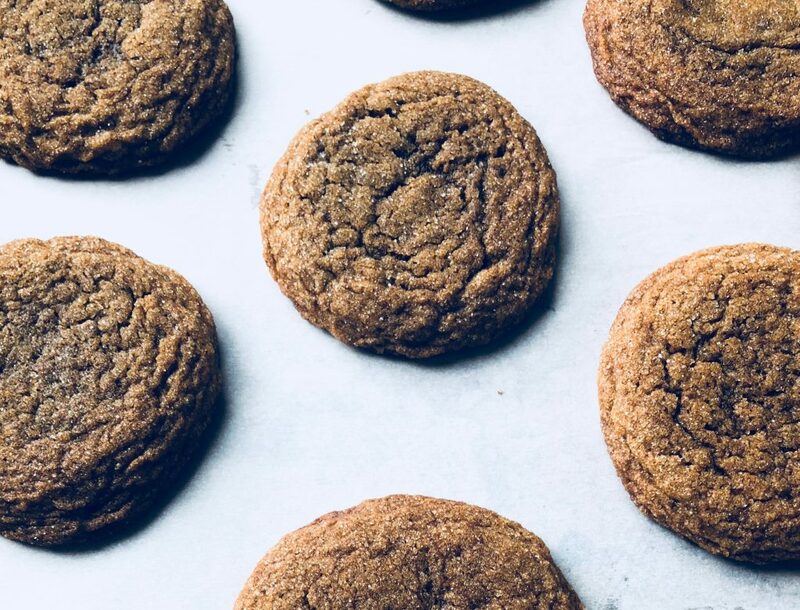 I like to lift my cookies off the parchment with a thin metal spatula dipped in flour to ensure the cookies do not stick or crack. Space cookies out by 1 in. They will not spread much. 5. Bake cookies for 8 to 10 minutes, depending on thickness, again I lean towards 8 minutes. Let cool for 5 minutes on the cookie sheet, then remove to a wire rack to cool further. 6. Cool cookies completely before icing or decorating. Store in an air-tight container or begin decorating! Few better combinations exist than graham crackers and Nutella! This truffle combines the two for an irresistible bite size dessert. I have brought these to many parties and always come home with an empty plate. They are so easy to make with only 3 ingredients. Your food processor does most of the work for these aside from the end dipping process. I frequently use heart shaped molds, but can be make into any shape you’d like. •2 boxes of Bakers chocolate (8 ounces), bittersweet or semi-sweet, or 8 ounces chocolate of choice. 1. Roughly break apart graham cracker sheets and place in food processor. Pulse a few times and then turn machine to low, if have setting, then high. Allow to run for ~30 seconds until you reach a fine crumb texture. Next add 1 cup of Nutella. Pulse until Nutella is well combined in crumbs. Mixture should hold together well when rolled into a ball. You will likely need another few tablespoons, up to one fourth cup more, of Nutella to reach your desired consistency. I usually use 1 1/4 cups of Nutella for my truffles. 2. Use 2 small spoons and gather 1-2 tablespoons of mixture. Roll into balls or place into plastic molds sprayed with baking spray. I use heart shape molds for mine (essentially looks like a plastic heart ice cube tray). Place in refrigerator for 30 minutes. After 30 minutes your truffles should feel firm to the touch. If not leave in for another 15-30 minutes. 3. Line a cookie sheet or large cutting board with parchment and set aside. 4. 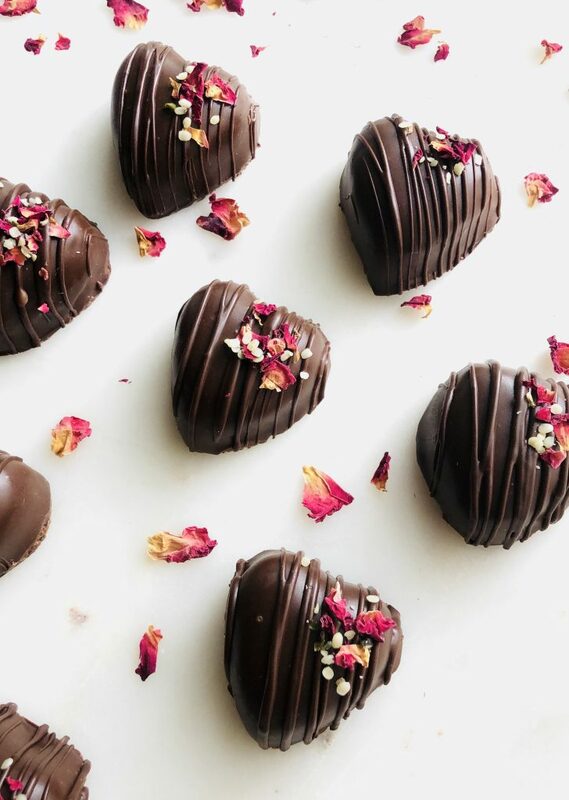 While your truffles are chilling, melt 6 ounces of your chocolate of choice. I find Bakers Bar or Ghiradelli melting wafers work best. To melt chocolate, place in a heat safe bowl over a pan of barely simmering water on stove top. This is essentially a double boiler. If preferred you may melt chocolate in the microwave on low heat in 30 second intervals on 60% power. If using a double boiler keep an eye on your chocolate and stir frequently to avoid burning. This will take about 5 minutes. Once chocolate is melted remove bowl from stove top pan -be careful as it will be hot! Add the remaining 2 oz of chopped chocolate to melted chocolate. Stir until melted. Chocolate should still be runny and thin, but if thickened up at all pop it back over double boiler to loosen it (30-60 seconds). 5. This 2 part step acts as a “loose” temper. This will help your chocolate stay hard at room temperature (not become soft). Tempering gives chocolate that wonderful “crunch” when biting into it. I do not get overly technical and measure my chocolate temperature as you would do for a true temper. This is an optional step. You can absolutely melt your chocolate all at once. 6. Now you are ready to dip! Place melted chocolate in a large mug or a glass Pyrex liquid measuring cup. It is better to dip your truffles in a tall versus wide heat proof container as it allows you to get a better coverage of the truffle when you dip. You want your truffles to be chilled but not freezing cold. If they are too cold your chocolate will tighten quickly, but if they are too soft they will not hold up well during dipping. I find it best to set out about 5 truffles at a time. Once dipped I go back to the fridge for more to ensure my last few are not too soft. 7. Drop one truffle into chocolate and completely submerge. Lift truffle out of chocolate with fork. Tap fork on side of mug to allow excess chocolate to run off. Place your dipped truffle on the parchment sheet. I find it easiest to gently help my truffle off the fork with an offset spatula. Repeat until all truffles are coated. You may need to warm the chocolate over double boiler a few times in the process. 8. After truffles are dry (should only take 10-20 min), melt any remaining dipping chocolate you have, or melt the 2 oz of chocolate listed above under “decorative layer”. Dip fork into melted chocolate and drizzle it over each truffle. You can also place chocolate into a piping bag and drizzle this way. This drizzle layer allows your toppings to adhere well. Be sure to add your toppings within about 10-15 seconds or the drizzle may harden. I usually drizzle only a few at a time and then add toppings and repeat. I top mine with chocolate covered hemp seeds, dried rose petals, cacao nibs, coconut, graham cracker crumbs, etc. The list is endless! 9. Allow truffles to set for another 20-30 min. When firm, take a small sharp knife and trim excess dried chocolate off from edges. 10. Now try not to eat them all :). This recipe is adapted from Kelly’s recipe @ Life Made Sweeter :)! I am absolutely in love with coconut butter. I tried it for the first time earlier this year, and cannot believe I went so long without this amazing ingredient in my life. It is rich and smooth just like peanut butter, and can really replace it for peanut butter, other nut butters, tahini, etc when baking. I hope you enjoy it as much as I do! 1. Preheat oven to 275. 2. Place 1 egg white in small bowl and lightly whisk with fork to loosen. 3. Combine dry ingredients, oats through unsweetened shredded coconut, in large bowl and set aside. 4. In a second bowl whisk to combine coconut sugar, maple syrup, vanilla and melted coconut butter (see below for melting tips). 5. Pour wet ingredients into dry and combine with spatula or spoon. 6. Once incorporated stir in egg white. 7. Spread mixture onto a parchment lined backing sheet. Bake for approximately 45-50 minutes, lightly stirring every 15-20 minutes. 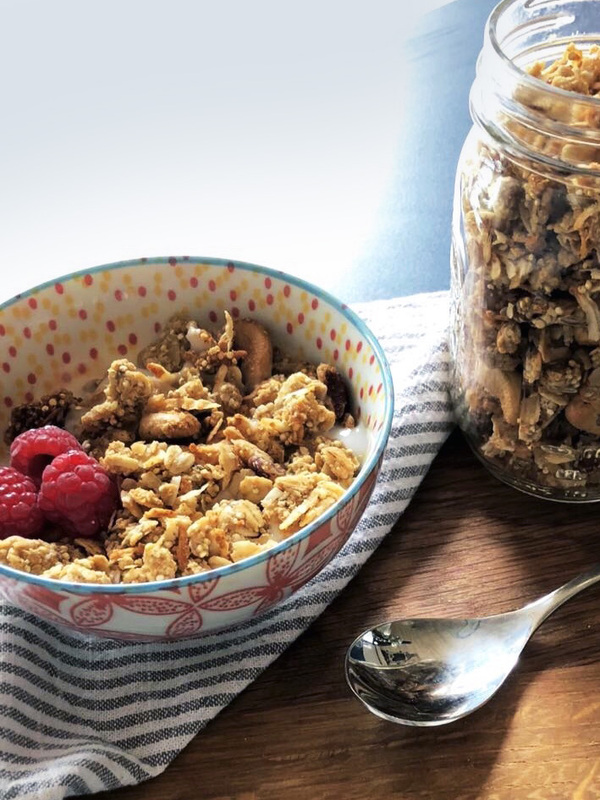 The granola is done when it no longer appears wet, is just becoming firm to touch, but still with a slight softness to it. 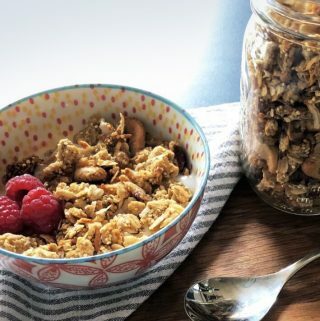 This slow baking method helps prevent burning or over crunchy granola. -You are welcome to use regular oats if you can tolerate gluten. Regular old fashioned oats are not certified gluten-free. -The maple syrup may be replaced with honey if you prefer. Lastly, if you have trouble finding coconut butter, aka coconut mana, you can replace it with any runny nut butter. -Coconut butter will be very firm in the jar. It resembles a peanut butter that separates with the oil on top. The difference is it will be solid, rather than runny. I find it easiest to place a saucepan filled with a few cups of water on low over your stove top. You do not want to boil the water, rather warm it. Remove any plastic labels from the coconut butter jar and place it in the pan with water. I usually put in enough water to reach half way up the jar. Allow the jar to rest in warm to very warm water for a few minutes. You will be able to stir the mixture shortly after it heats through. It will have a consistency similar to tahini. Now you can measure and carry on baking! 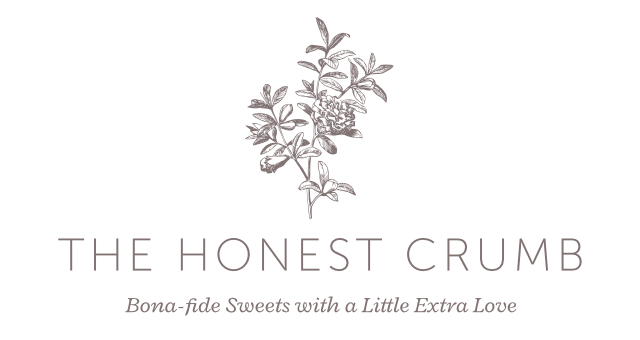 Hello and welcome to The Honest Crumb! My name is Kaitlin and I am excited to share my recipes, tips and favorite products with you. Passionate about baking, I experiment with natural products to create healthy, delicious baked goods topped with a little extra love. Check out my taste-good, feel-good recipes!